The main hall of the Spodek Arena is the heart of this iconic venue. Its incomparable ambience is created by a slight pitch and a dome which constitutes a central part of the hall’s ceiling and creates a cosmic aura. Both organisers of events and participants underline the special atmosphere of the facility, which makes them come back again and again. mobile green sectors (near the main floor). Green sectors may be hidden – in this case the surface of the main floor is extended. Information on the capacity of individual sectors is provided in the tab on the left hand side. 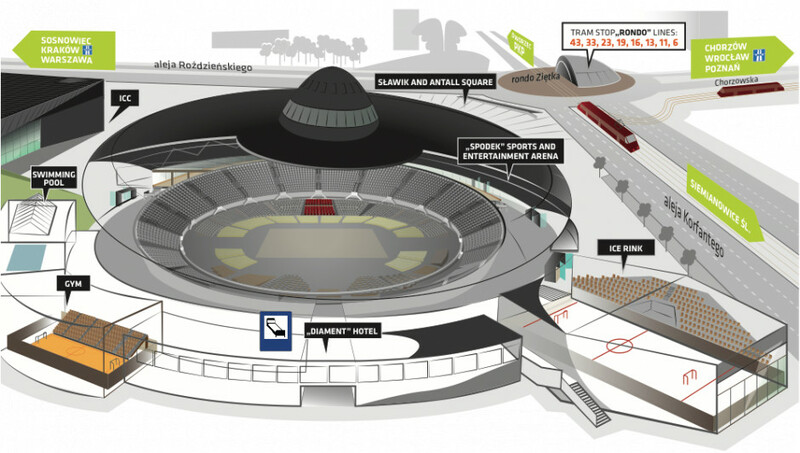 The facility may host 11,000 people during sports events or events where the stage is located in the centre of the main floor, which makes it possible to use all the surrounding sectors (martial arts galas, shows on ice). A standard concert event may host some 8,000 people. The Spodek Arena’s main floor may be used as a space for standing people and depending on the size of the stage it may host up to 3,000 people. It is also possible to place seats on the main floor in several configurations. Information on the capacity of individual configurations is provided in the tab on the left hand side. The facility is connected to the International Congress Centre via an underground passage, which provides for convenient organisation of events that use the potential of both buildings.